How can anyone be tricked twice? Isn’t there even a saying about that? Zaria Fierce is determined to get things right this time and with the Drakeland Sword in her possession she’s ready to take on trolls, dragons, and whatever else may come… but first she and her friends are going to have to figure out just how much trouble they’re in at home. Disclaimer: Thank you Keira Gillett for providing me with a copy of this book in exchange for an honest review. Zaria Fierce and the Dragon Keeper’s Golden Shoes is the third (and possibly the last) book in the adventure series Zaria Fierce. This is a series I have been following since I was first contacted by the author, Keira Gillett, last year and I am so happy I accepted Keira‘s request to be part of this wonderful journey. I adored every single minute of this adventure and I’m looking forward for more books from this author. This book happens immediately after the events of the second book – Zaria Fierce and the Enchanted Drakeland Sword – where Zaria unfortunately was tricked into freeing Koll using the Drakeland Sword. With the help of her friends and Hector, the Stag Lord, they venture into various realms in order to finally rescue Hart. And after they accomplish that, they have to get Queen Helena’s shoes so they can travel to the Under Realm to finally defeat Koll and his brothers. One of the most important themes in Keira‘s books is friendship and I always marvel at how beautiful she describes Zaria and her group of friends. They always support each other and are always there for whatever comes their way and never once falter to protect the other. They develop in such a slow and fluid way you basically see these characters grow since book one and see their friendship becoming tighter. And Zaria was perhaps the one that grew up the most since the first book. After learning the truth about her birth parents, realising how important her role is in saving the world, she could just turn her backs and leave – or letting it all go to her head – but she stays and fights till the end though not without doubting herself. She’s brave and courageous and I will miss her. Well, I will miss all of them to be honest. As always, I’m completely mesmerised by how much the Norwegian folklore is present in these books. There were a few new “beasts” such as the banshees and the mares (which scared the living hell out of me to be honest) but the same old creatures made a cameo. We had the trolls, witches, the dwarves, the ellefolken, dragons, the lot. The fantasy in these books is strong and so beautifully explore and described I almost felt like I could wander through Norway and stumble upon these eerie creatures and realms. Keira‘s writing is always fluid and easy to read and, even though I’m repeating myself it’s always worth mentioning, you can see how much she has developed as a writer since The Secret of Gloomwood Forest. The way she describes the characters, the setting, the fantastic creatures makes everything seem real. Not to mention how she approaches not only the Norwegian folklore part of the book with such a dedication, but other themes such as friendship, bravery, family and believing in yourself. The illustrations by Eoghan Kerrigan are stunning as I keep mentioning. There was one particular illustration I adored above all else. Alongside Keira, he made this wonderful universe come to life and gave them a real aspect. I think that this book would be incomplete without his touch in it. Overall, Zaria Fierce and the Dragon Keeper’s Golden Shoes was a spectacular conclusion to a great trilogy (though that ending left the door open for more adventures). Filled with magic, a great story line, amazing and real characters, wonderful settings and beautifully explored themes, Keira Gillett created a trilogy that I will always cherish and will visit anytime. 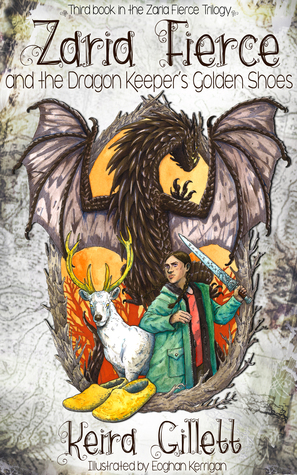 If you like The Chronicles of Narnia, The Hobbit, The Spiderwick Chronicles or simply love a book filled with Norwegian folklore and fantasy, then this is the ultimate series for you to read, devour and lost yourselves in. 1 Cup - Not my cup of coffee!!! 1,5 Cups - Could have tasted so much better!!! 2 Cups - Not sweet enough!!! 2,5 Cups - Weak coffee but enjoyable!!! 3 Cups - This coffee is drinkable!!! 3,5 Cups - This is what I call a nice cup of coffee!!! 4 Cups - Strong coffee means great coffee!!! 4,5 Cups - This coffee is blissful!!! 5 Cups - This coffee is the pure Elixir of the Gods!!! Read Review Policy for more information! Find your next read from our book jar. Enthral: to capture the fascinated attention of. Book reviews, Book-ish Babble, and occasional writing advice. A reader who vicariously lives her life through fictitious characters. Future English teacher writing about books I read and books I want to teach.